WIN WIN WIN!!!! Let the party begin! Each day for 12 days in a row we will be sharing three or four prize packages with you. Leave a message under the blog post for each post in order to be entered for all 45 Prize Packages. Visit the prize sponsor on facebook (LIKE THEIR PAGE) and say hello from Creative Scrapbooker Magazine or CSM. NOTE do not use the same comment everytime you post on facebook – Facebook thinks you are spam and may block you. Day#8 of 12 Starts NOW! Our first prize is from Creative Memories Creative Memories is giving away an assortment of products from the Sugarplum Collection. Our second prize is from Creative Scrapbooker Magazine We want to giveaway a second FREE one year subscription to Creative Scrapbooker Magazine! FOUR fabulous issues will be delievered right to your door starting with the Spring 2018 issue that hits newsstands on March 01 2018. YOU WILL LOVE IT! The third prize is from Impression Obsession Impression Obsesssion is giving away this collection of clear stamps just for you! So much wonderful all in one beautiful package! Oh the things you will create! Thank you Impression Obsession! Merry Christmas and thanks so much for playing along with us!! You have until Dec 23rd midnight to enter to win all 45 prizes! Another great giveaway! You guys are awesome! Great package … AGAIN!!! Thank you so much! LOVE me some CM and CSM!! You folk are amazing! Today is one of my favorites. I actually have been using CM albums, paper, and tools for 19 years; I love your magazine; and I’m excited to see a product thats new to me. Thank you CSM – and sponsors – for the 12 days of fabulous crafty goodies! Wow already day 8! Such fantastic prizes! My very favorite companies! Yeah, what a great prize package. Thank you for this chance. I just love this and look forward to your post daily!!! This is wonderful Merry Christmas Creative Scrapbooker. There are so many great ideas for crafting, stamping, making! I’m loving these sponsors! Thank you again for sharing! All my favorite crafting companies are sharing. It is the most wonderful time of the year. Awesome giveaways! Thanks for the chance to win! Wonderful Day 8 giveaways! Happy Holidays! Love, love, love todays giveaways! Another great day of give aways, awesome prizes. Awesome prizes, I would love to win any oF them! Thanks so much for all the inspiring ideas and everything else that goes into making CSM! Thank you Creative Scrapbooker Magazine for day eight in the Twelve Days of Christmas and also for including a subscription in the prizes! Another year of CSM! Awesome! How awesome!! Would love to play with these… Thanks for the chance! Love the Creative Memories package and A free years’s subscription would be nice as mine runs out in the spring. Thanks to all the sponsors. What great prizes – thanks for a chance to win. Would love to play with any/all of this! Thank you for another great prize offering.. Great way to celebrate the Holiday season with a giveaway! WOW Another day of generous gifts!!! Best wishes and good luck to everyone! Happy Holidays CSM and thank you! Oh I am so tickled .. CSM you make me smile! Yet again – another awesome day of giveaways! Here’s hoping! THese are a few of my favorite things. Sing along! Another fun collection of goodies that I would love to give a home to. THANK YOU TO THE GENEROUS SPONSORS! Hoping for some luck this year. What an amazing crafty prize packs giveaway! Loving all these giveaways, thanks so much for doing this. What lovely great giveaways today. The sugarplum collection will looks so nice on our layouts! The stamps will add so much to our cards. Thanks to the sponsors and CSM for the contest. Merry Christmas!!! I’m loving all the prizes. Thank you for the opportunity to win! Love CM products! Thanks for the chance! Another day of treasures …. lovely to wake up to 😀 Thanks for hosting this great giveway! Good morning Day 8 is done thank you so much!! Day 8 and the prizes get better and better! Thank you to the sponsors, thank you CSM!!! This has been fun to see all these companies and products, some of which are new to me. Thanks again for a chance to win some goodies! Amazing items, I want this so much! More great prizes — and the excitement builds !! Merry Christmas fellow crafters !! Thank you for more great prizes to win! The animals are so cute!! Thanks for the chance. What a great prize. You guys are so nice. The prizes have been so great. Thank you very much. CSM keeps giving and giving….. LOVE you CSM! Another day of great prizes, thank you. Hurray… more great prizes. There’s going to be some very happy winners. Thanks CSM and sponsors. Merry Christmas. Thanks for the chance to win. Thanks you CSM for the chance to win Day 8! Thanks CSM for donating a year’s subscription and to the other sponsors for donating. Wow – today’s prizes are amazing. Hope I win…what fun! Great prizes, again! Thanks CSM! all done for today. 🙂 Great contest, Loving it! More great stuff! Merry Christmas! Greetings from Cardinal Ontario and CSM! Finding some new go to places for my crafting needs through this contest! Such amazing prizes! Merry Christmas! Another wonderful array of prizes! Just found you…very pleased with everything Merry Christmas!! Thanks to all the sponsors for helping make someone’s Christmas extra crafty!! Love all of these companies! You guys are doing heaps for my Xmas spirit!!! Thanks for the fun! Thanks CSM for the chance to win some goodies!!! Another great set of prizes. Thanks for giving the opportunity to win such great products. Thanks again for putting together such fab sponsors and giveaways! Such great prizes again today! I am enjoying all the products/ideas!! Thanks! Another day of awesome gifts from your sponsors. Thanks to them and you for doing this. Thank you Creative Scrapbooker for being amazing! Merry Christmas to you and all the scrapbookers out there. Another day of lovely prizes. Thanks for the opportunity. Merry Christmas to all of you. What a great give away day. CM,CSM and stamps! Yeah! Thank you to all the sponsors who have given us such great treats throughout the year! Hello CSM, just visted creative memories, hope to win kit…..
Great resources! I’m loving your links. Thanks. I love creative memories and this giveaway would make an excellent gift! just love the magic of this set, have used CM albums for 11 years, and would LOVE this one. Happy Christmas and a wonderful New Year to you all at Creative Scrapbooker! I don’t do Instagram so I can’t follow your magazine there. Love the little critters on the Creative Memories paper. IO has the best stamps – always fun and playful. Nice! Great for kids page. Thank you so much for this fun give-away. Good luck to everyone who enters. Merry Christmas CS! Another fabulous day of prizes and sponsors! Thank you for doing this every year! Each one is such a lovely prize! Thanks again for the change to win! Yet another fabulous giveaway. Thank you so much. How do you come up with all of these goodies? Really nice products. I am loving this contest and all the cool prizes offered! More awesome prizes. How lovely. Thank you, thank you! Creative Scrapbooker is an awesome web magazine that I love to read! Another day with a great prize package. Thank you for the opportunity to win. I am especially excited about the magazine subscription. It is a quality publication that is chock full of inspiration in every issue. A wonderful prize package! Another day another great prize! Thank you for hosting 12 days! Love your giveaways Creative Memories company was my first introduction to scrapbooking. So nice to see they are still around. Thanks for the continued chance to win some really neat prizes. I look forward to seeing what you have for us to wish for each day. I love scrapping and all things mixed media.I love this!12 days of Christmas!Yeah. Woo hoo those stamps are amazing! More companies I am not familiar with, but I am excited to learn more about them! Exciting giveaways today! Happy holidays! Hello CSM! I don’t have Instagram but I do follow you on Youtube and Facebook, so hope that counts as an entry for this amazing giveaway. Happy Holidays! Done and done! Thanks for the holiday spirit CSM! Another amazing day of prizes! Words cannot express how much these giveaways mean to us crafters! Thank you so mean! Hope you all have a wonderful Holiday! All the sponsors and my fave magazine are so so generous~ I make sure that my to do list for the day includes entering for these amazing prizes! Thanks is never enough for all the great prizes all the sponsors give towards 12 days of giving! CSM thanks for all your hard work! All your prizes are so amazing. Thanks for the chance to win. Love pastels for Christmas! Amazing Giveaway! Done for today -thanks as always! Thanks for the chance to win these fabulous prizes! It’s fun to play with these amazing ideas on your magazine AND checking out the sites for the giveaways. Thanks and Happy Holidays! absolutely FABULOUS sponsors and prizes today, as usual. Super excited to have found you via Kraftin’ Kimmie Stamps! The prizes have been awesome! I’d be s happy to win any of these prizes too. Wow I can’t believe we are on day 8!! Only 6 more sleeps till Santa!! Thanks for another great day! Cute prizes! Love the generosity during this holiday season. I’m just so amazed at all these generous products these companies are providing! They are the best! And Merry Christmas to them all! What a wonderful holiday season with so many presents being given away! Thank you for your generosity. OMG the sponsors have great prize packages today! As always great items in your giveaway. WOW !! Awesome giveaways ! I would love to win a prize ! Keep calm and prize on. Thank you so much for the chance to win such wonderful prizes. This is awesome! Thanks for the great prizes. Each day of the giveaways is so much fun. It is great to see products I have never seen before, and to take a few minutes away from the craziness of the season. Thank you! This so awesome, thanks for all the gifts!! Eeek, so exciting!! We’re almost there! Thanks for all these awesome prizes from these great sponsors! Ohhhhh I love all these prizes. Thanks for the chance to win. Great prizes once again! Thank you! Fabulous giveaway!! Love that CM collection!! It’s been another good day! Fun prizes, thanks for the chance to win! Thank you to today’s prize sponsors! I love Creative Memories, Impressions Obsessions and of course your Magazine!!! Such a fun contest and I am finding new websites to visit! Great prizes. Thanks for the opportunity to win. Would love any of these fabulous prizes! Wow! Amazing prizes sponsored by such great companies. Another great set of prizes thank you! Another great batch of prizes! Thanks to all the sponsors! Thanks for all the great sites to check out. A new subscription would be divine as mine just expired. I check every bookstore in town but have yet to hold a CSM magazine in my hand, I love CM and I would love a CSM subscription for 2018 too! I do have one problem. I’m making plans for ALL the prizes…. Thanks for all the fabulous sponsors and their prize packages! What a great season of giving! Keeping my fingers and toes crossed!! Lots of goodiness today!! Thanks for the chance to win CSM!! Thank you again for another day of great product prizes! Another day of awesome prizes! I am ready for Christmas! Shopping, baking and wrapping is all done! 5 days to go…are you ready??? Love this collection! Would love to win it! Love this giveaway! Creative Memories’ Sugarplum collection is so cute! 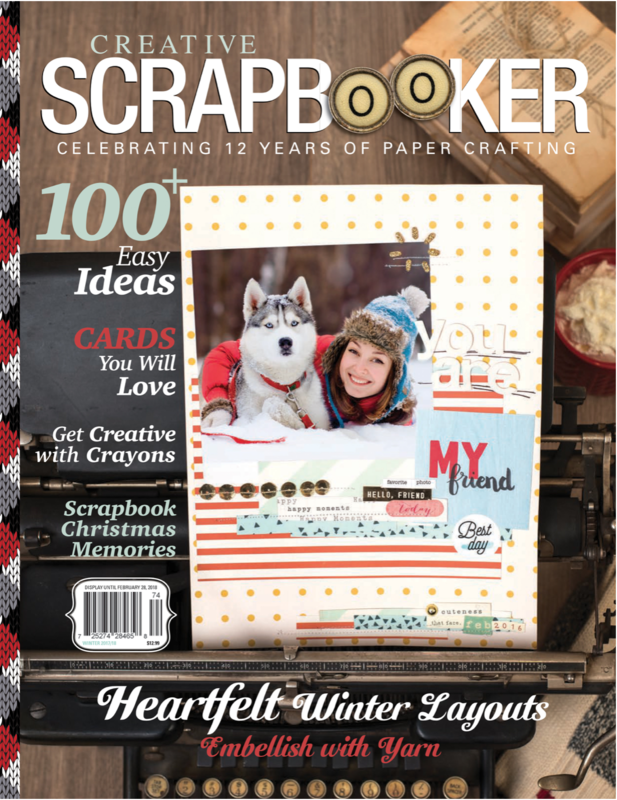 My subscription to Creative Scrapbooker magazine is about to expire…perfect timing to win!!! And I love stamping which would make Impression Obsession lots of fun! Cute Christmas items! !Christmas is almost here! Another great group of prizes. Would love to win any and all. Thanks for the opportunity. Thank you great prize package! OMG How wonderful those prices are! Thank you for been so generous! Wonderful prize packages! Already following CSM on instagram…. Thank you for such an awesome giveaway. Also thanks to the sponsors. Merry Christmas to all of you who are working hard to make this a great giveaway for us! Blessings! Once more…great prizes! Thank you! Thank you CSM for another wonderful days of prize donations. Hi CSM!! Thank you again for hosting this awesome giveaway! Thanks CSM for the chance!! the sugarplum collection is SO CUTE!! Love the color scheme!! Thank you! Another amazing giveaway!! Such a terrific day of giveaways! I love all the creativity this days has to offer. Thanks for the chance to win! Thanks C S amd Merry Christmas to you all! Such fantastic prizes. Thank you CSM and sponsors. Such great giveaways. Another great selection of prizes. Thanks for the chance. Another great day of Prizes!! I feel lucky!!! Would love to win any of these prizes….great giveaways again! I love CM! Thanks for the chance to win. Fingers crossed-I hope i win one of these great prizes!!!!! Wow! Every day the prized are different but each one is very interesting !!! Thanks to the sponsors and also to the magazine to organize this! Another day of incredible giveaways! Today’s prizes are so cute! Thanks for all of these fantastic giveaways! Such a cute collection from CM. These crafty companies are spoiling us! These are terrific prizes. You guys rock! Awesome giveaways they are amazing. Thanks CSM! These are such great prizes! Still hoping for a subscription!! Love everything about CSM!! Woot! Love CSM, would love to be a winner, Happy Holidays! The prizes so far are off the charts. Awesome. Thanks for the chance to win them. Thanks to CSM and all the sponsors – such fabulous prizes! Good luck to all. Happy holidays!! Wishing everyone good luck with these fantastic prizes! More great products. I would love to win some of them. Great contest. Thanks for the chance to win. Seasons Greetings! Love love this package!!! Thank you for putting on this giveaway! The sugar plum package from CM is the bees knees!! Thank you for putting on this giveaway! So in love with all these lovely prizes and the sponsors. Another awsome prize. Thank you for the opportunity! More fantastic prizes in this giveaway – I’ve got my fingers crossed that I’m a winner! Just more awesome prizes, all i can say is WOW to these 12 days!! Ooo, a subscription would rock! What darling colors CM has chosen for that, and those stamps are fab too. This is my favorite time of year! Thank you everyone for the chance to win great prizes! I ADORE that Sugarplum collection, so cute! All of these prizes are fabulous! Loving those stamps and a year subscription would be amazing to have! Thanks for a chance to win! Another great day of giveaways! This is so fun to see each day! Thank you to all the wonderful sponsors! That Sugar Plum collection looks so sweet! Thanks CSM! Thanks for so many great giveaways! Another fabulous day! Day 8 and the quality of the prizes has certainly remained high. thank you for the chance to win and for the fun of participating. Awesome!!! Thanks for the chance to win! Merry Christmas CSM. Thank you. Thanks for another day of great giveaways! And Happy Holidays TO Creative Scrapbook Magazine! Such an adorable set from the Creative Memories Sugarplum collection, and someone will be very happy to win a year long subscription from Creative Scrapbooker!!! The excitement builds day by day. Amazed at all the great prize packages. Thanks for the chance to win these great prizes. Merry Christmas! What a great prize pack!!! The collection from CM is too cute, another year of Creative Scrapbooker-woo hoo, and those stamp sets are adorable!!!! Thanks for the chance to win!! I love that I have a second chance to win a year of CSM!!! Still rolling out the cool prizes – thx! Great day of giveaways. Would love them all. Thank you for the opportunity to win. Would love to win this year. Thanks for a chance to win!! You guys are awesome! Thanks for the giveaways! I can’t believe all the great prizes. Thank for the chance to win. Wonderful products and giveaways. Love Scrapbooker magazine. Thanks for a chance to win. Wow such great prizes. Thanks! Oooh such a good prize day! A subscription to CSM would be such fun to win. Happy Holidays, and thank you for even more lovely sponsors and giveaways! Yay for beautiful creative Memories products! Would love to,subscribe once again….. And love those stamps! I would be happy to give any of these goodies a new home..Thank you for such a fun time and big chance..
Love the CM package and Impression stamps are one of my favourites! !, thanks for the great prizes! Thank you again Jackie and CSM team for today’s gifts under the tree! All familiar and all dearly loved. It is hard to get some of them here and OH MY, did you see those penguins from IO – LOL! I’ve never done Instagram before but I am sure going to learn how now after the 12 Days so I have to thank you for that too! Love Creative Memories. Thanks for the giveaway! Getting your magazine for a year would make getting the mail so much better. I can’t believe there are only two days until it is Christmas Eve! I am hoping Santa puts at least one of these amazing prizes under my tree with CSM’s Help! 🤞🤞🤞🤞🤞🤞 TFS! Creative Memories is very cute! Love the colors. Eek did you see that cute moose? Not to mention those awesome stamps! Good luck to everyone! Fantastic giveaway on day 8. Thank you to all the sponsors and CSM. And the fabulous prizes just keep coming! Would love to get the sugarplum colourful from creative memories. I really like their products. Hope to win this one! Thanks Csm. Thank you CSM. Happy Holidays. Love all these companies, thanks again! I’m feeling very inspired to go crafting!! THanks for all of the inspiring give-aways! I love IO Stamps, such great designs! Thank you for the chance to win! Great prizes Once again. Thanks CSM! Great day with all the fun prizes…love the 1 yr subscription! So excited for the chance to win! Thank you! Follower # 1303 on instagram, that has to be some kind of Halloween good luck that Jack and Sally would appreciate! Thanks for another great chance to win fabulous prizes! Loving those stamps!! Love Creative Memories, Creative Scrapbooker Magazine, and Impression Obsession! Thank you for participating in the giveaway! Merry Christmas to all of you at CSM and all of the sponsoring companies. This year the prizes are just incredible. Sweet dreams tonight as I sleep with Creative Memories Sugarplum Collection dancing in my head! Impression Obsession for the rubber stamper in me, and a year of CSM for free! Day 8 is great, but you already know, ’cause you work for the big guy – Ho! Ho! Ho! Thanks for another great day of wonderful prizes CSM and your amazing sponsors! What awesome products! Thank you sponsors! Love these prizes! So Awesome! More great prizes!! Thanks CSM! Love these products! You always have great prizes to win! Wow! What a fab prizes! Merry Christmas! Love the new products CM keeps coming up with.